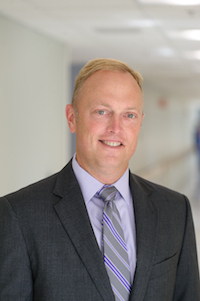 (Fall River, MA) – Saint Anne’s Hospital announced today that Saint Anne’s current Chief Financial Officer and Vice President of Operations, Michael Bushell, will become the hospital’s next President, assuming the new leadership role after having been with the hospital since 1999. Saint Anne’s President, Craig Jesiolowski, has announced he will accept the role of President at Holy Family Hospital, overseeing both its Methuen and Haverhill campuses with a combined total of 385 beds in northern Massachusetts. Saint Anne’s and Holy Family are both part of the Steward Health Care System. Saint Anne’s Hospital has 185 beds, more than 1,500 employees, and contributes more than $4 million annually in charitable donations, free health care programming, and other community benefits to the Fall River area. Saint Anne’s is also among the largest tax-paying employers in the region. Last year, Saint Anne’s Hospital paid taxes equivalent to the average annual salaries of approximately 40 firefighters; 36 police officers; or 31 teachers. Bushell has been with the hospital since 1999. He has overseen the expansions and renovations of Saint Anne’s Emergency Room and Operating Room, and has spearheaded physician and business development. Craig Jesiolowski has served as President of Saint Anne’s Hospital since 2010. During his tenure, the hospital has earned state and national recognition in numerous areas of care for both quality and safety. Jesiolowski presided over an unprecedented level of construction and service line expansion at Saint Anne’s, including the Center for Orthopedic Excellence and private rooms across the hospital. During this time, Saint Anne’s has also developed formalized partnerships with key area physician groups, including PrimaCARE and Hawthorn Medical Associates, while enhancing the hospital workplace culture. In his new role, Jesiolowski plans to implement similar strategies at Holy Family Hospital. “I am honored to accept the position as president of Holy Family and look forward to ensuring that patients receive superior care as we expand the essential services we provide to the public,” said Jesiolowski. Both Jesiolowski and Bushell will start their new positions on October 3rd. Steward Health Care is the largest fully integrated healthcare services organization and community hospital network in New England. Headquartered in Boston, Steward is the fifth largest employer in MA with more than 17,000 employees in more than 150 communities. Steward is comprised of Steward Medical Group, Steward Health Care Network, and Steward Hospital Group. Steward Medical Group provides approximately 1 million patient encounters per year in 152 sites and manages homecare and hospice with 300,000 and 35,000 encounters respectively. Steward Health Care Network, a fully integrated care management company, has 3,000 physicians, with approximately 4 million patient encounters per year and affiliates or joint ventures with approximately 30 urgent care centers. Steward’s Hospital Group includes Saint Anne’s Hospital in Fall River, Holy Family Hospital in Methuen and Haverhill, St. Elizabeth’s Medical Center in Brighton, Norwood Hospital, Carney Hospital in Dorchester, Good Samaritan Medical Center in Brockton, Nashoba Valley Medical Center in Ayer, Morton Hospital in Taunton, and New England Sinai Hospital in Stoughton. Additional information is available at www.steward.org.